Caerhays Castle Garden is an informal woodland garden which overlooks the sea. Origins of the 60+ acres garden can be traced back to the Chinese plant hunters around 1900. 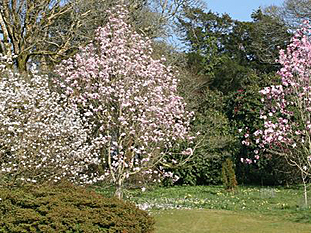 Home to the Williams camellia hybrids, Caerhays is best known for its huge, Asiatic magnolias, usually in their prime in March and April. 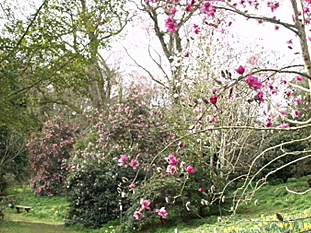 Caerhays Castle Gardens are a special place for lovers of Camellias, Magnolias and Rhododendrons. The Williams Family sponsored some of the great plant hunters and their discoveries have a marvellous home in this beautiful setting on the Cornish coast, north of the early 19th century castle, designed by Nash. The origins of the garden, which extend to over 60 acres, can be traced back to the work of the Chinese plant hunters at the turn of the Century. 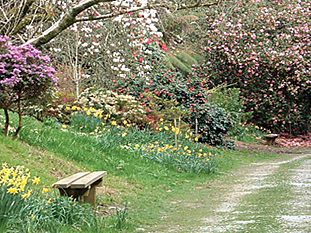 Caerhays informal woodland garden, which overlooks the sea is home to the x williams camellia hybrids but is perhaps best known for its huge, Asiatic magnolias, usually in their prime in March and April. The garden is a wild one and therefore some of the best things it has to offer have to be hunted out and are often not immediately obvious on the main routes. The main flowering season is normally between January to mid May so the visitor who only comes once will see only a small part of what the garden has to offer. First turning right off the A390 after Grampound (signposted to Tregony and St Mawes) then follow signposts to Caerhays. First turning after the end of Sticker by-pass (signposted to Tregony – B3287) turn right at first junction and then follow signposts to Caerhays. Head for Gorran Churchtown and look for signpost to Caerhays at Gorran High Lanes. Take right turning from A3078 (signposted to Veryan) and next turning left signposted to Caerhays.